Well, I promised to post some photos, so here we go. I didn't build any of the amps, yet, so I'm posting some build photos of the guitar. 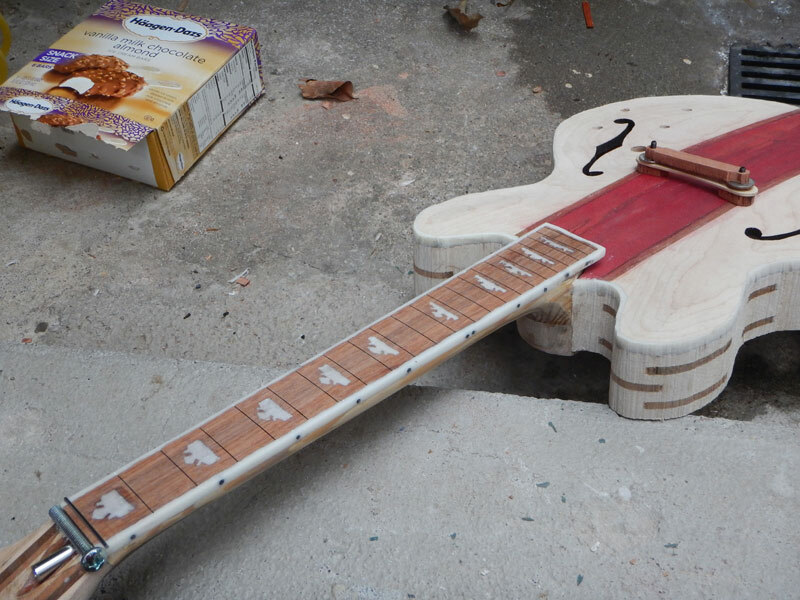 First, the entire wooden part of the guitar is made out of scraps and wood that I picked out of dumpsters. Also, some of the hardware is assembled from garbage (the Coca Cola bottle caps were literally taken out of trash cans in Venice). 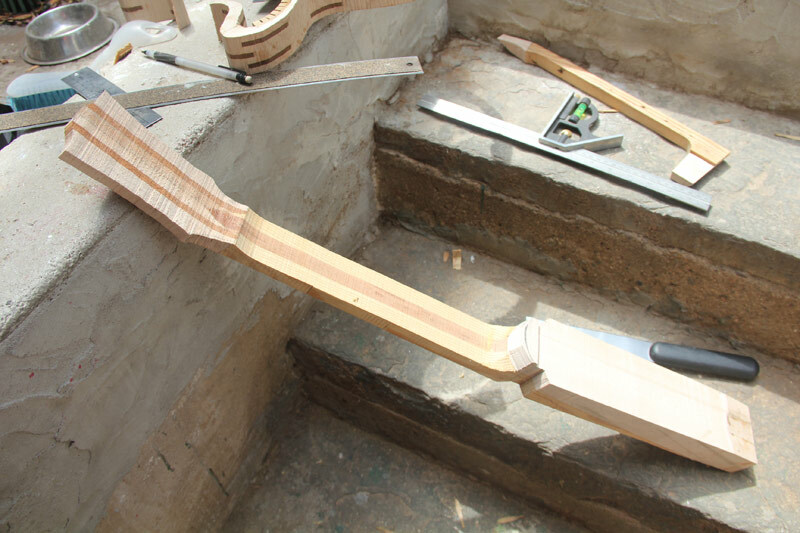 When I started building the guitar I didn't know how it was going to be built or finished, so the whole thing is improvised. 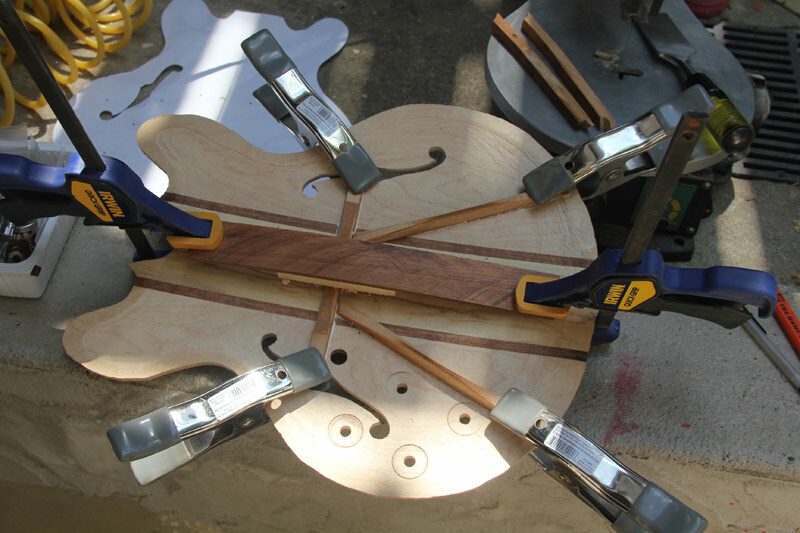 At the end I realized I had no clue what I should use for the tailpiece and then I suddenly laid my eye on an old woodworker's plane, so I used part of it for the tailpiece. 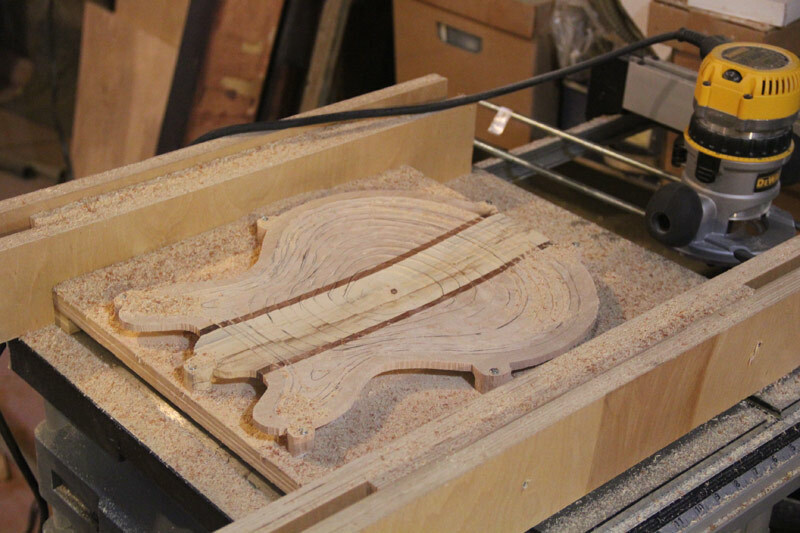 Also, I should probably explain why I even started building this guitar. My 5-year old discovered Chuck Berry on YouTube and asked me, "What kind of guitar is that?" I told him it was a Gibson ES-335, then he started pestering me that he also wanted one. Eventually I told him we would make one together, so we started working on it and that's what came out. For the sides of the body I stitched together pieces of maple that I found in a dumpster at a lumber yard (I was initially going to buy maple, and then I saw what they were throwing away). I printed a template and glued straight pieces at various angles. 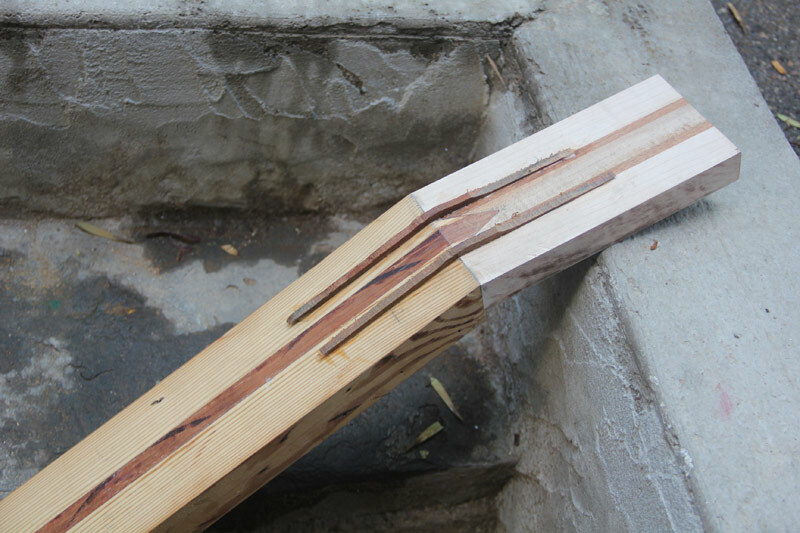 I reinforced the glue joints with mahogany splines (you guessed it, also from the same dumpster). All the segments together make up the outline. 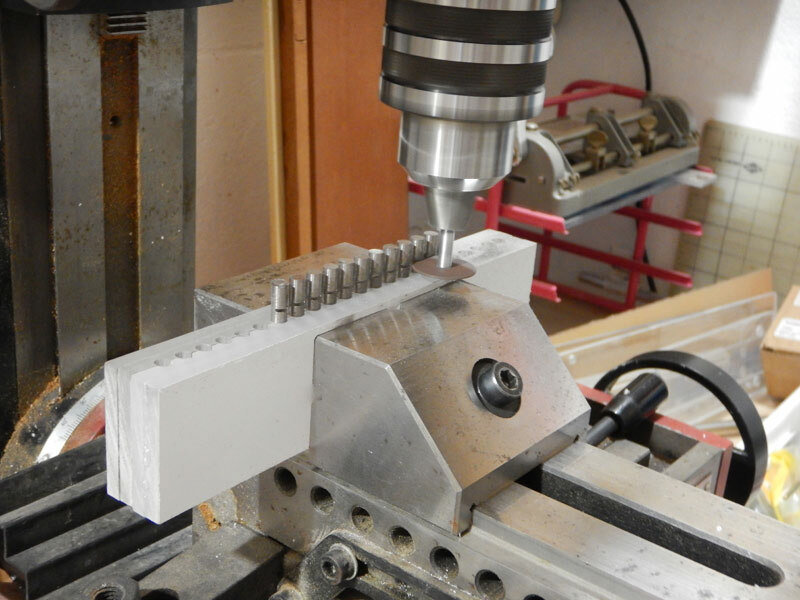 Then I cut around on the band saw. 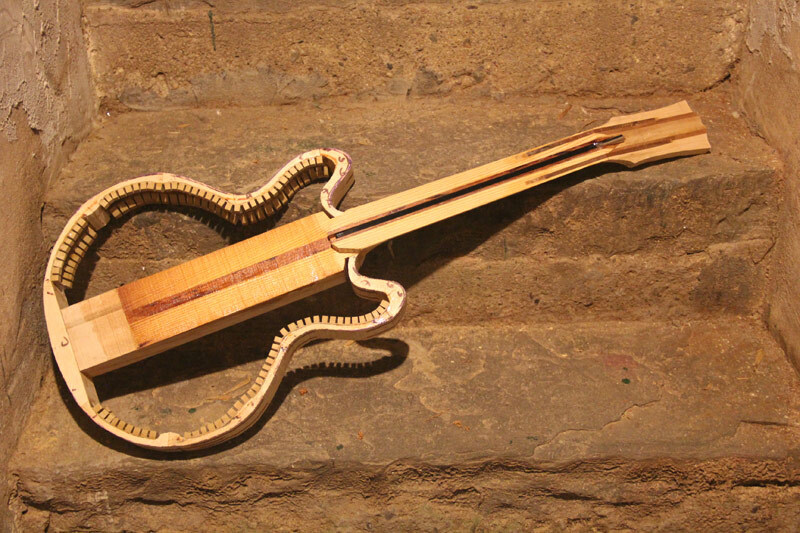 The top is carved from three scraps pieces of maple joined with strips of scrap mahogany. And the inside hollowed out. Notice that the center maple is different color. That's because it's fire wood. We cut our maple tree two years ago and I kept some fire wood. I kept it outside and it became what's known as spalt maple (basically, the beginning of decay). One has to use wood hardener when using spalt maple for any kind of builds. So, basically, the center part of the guitar top is from our family tree. The idea is to make a conversation piece, so here it is. The top dry fitted on the sides. I like to salvage stuff. So, recently a friend told me about a piano he was tossing out (it was beyond repair). I took out the sound board because I will eventually build a harpsichord for my kid. I also took some other parts, like the keys. 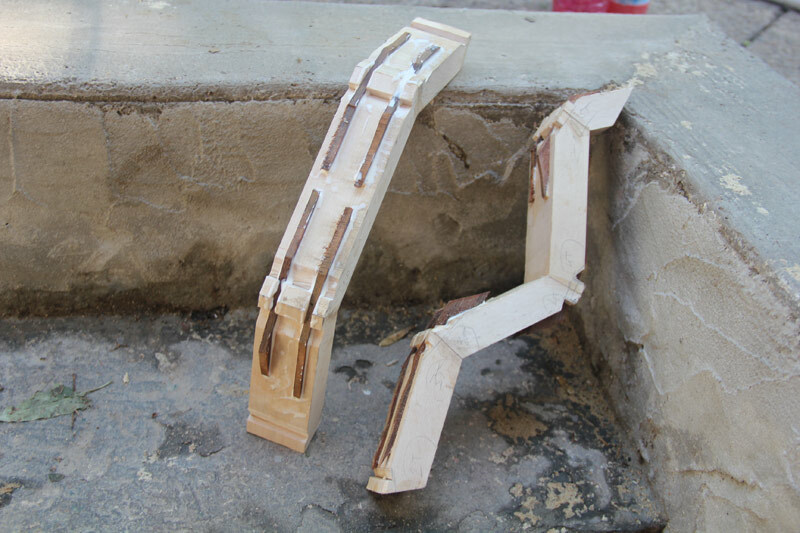 So, here is the internal bracing made from 100 year old piano keys (spruce). Now the neck. Main material is a 100-year old piece of pine from a floor beam of an old brownstone that they were gutting in my neighborhood. I did more cutting and made a book matched neck with a piece of scrap mahogany in the middle. 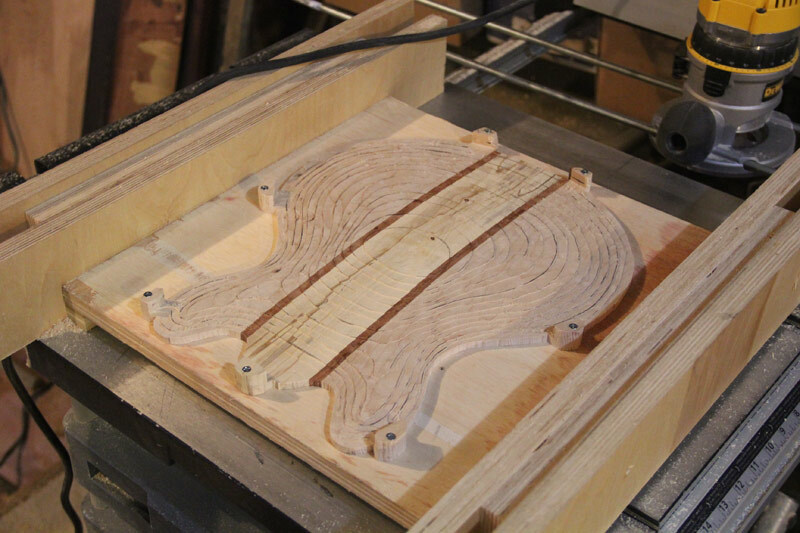 The headstock is scrap maple and mahogany. 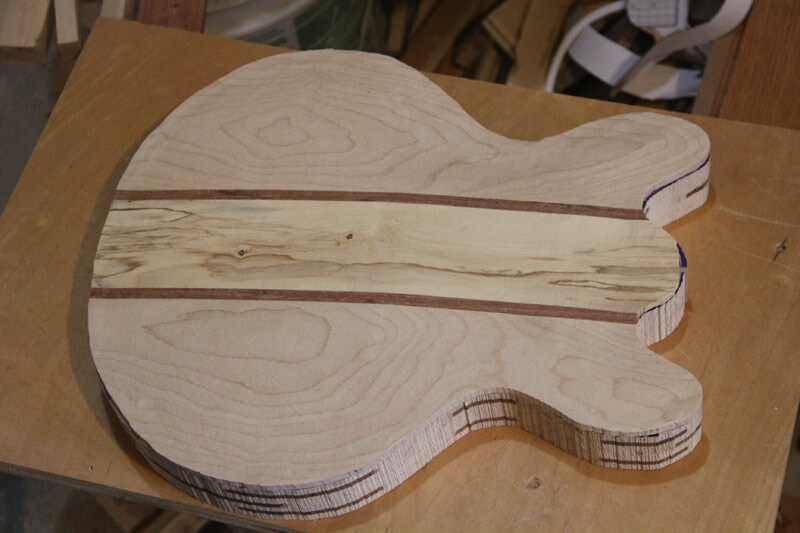 Then I carved the neck and here it is fitted into the body. All the "bindings" and "inlays" are epoxy mixed with some leftover baby powder from when my kid was a baby. Here's some more assembling. The archtop style bridge is bade from a Haagen Dazs ice cream stick, some scrap mahogany and two dimes, drilled and threaded. 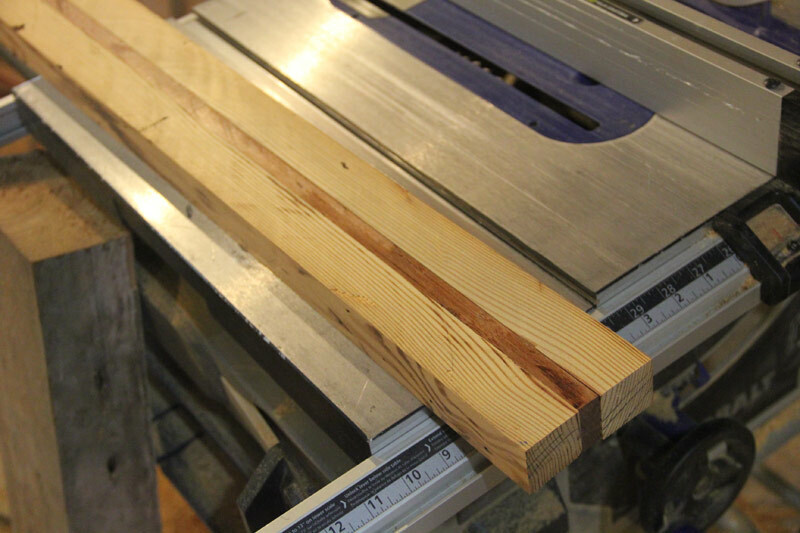 Cutting pole pieces for pickups. Winding with 43 AWG wire on a lathe. The back is mounted with screws, so I can always unscrew it and work on the electronics. The pickups are humbuckers. The pots are all push/pull. So, tone pots switch from pickups to piezos. The brighe has actual built in piezos inside the actual bridge and the saddle is from a soup bone, carved with a drill bit that my dentist gave to me, and mounded on a Dremmel tool. The Volume pots switch form series to parallel, for the humbucker configuration. The pickups are floaters that are mounted on the pickguard, so the guitar is actually like an archtop and has an archtop bridge. Frets are stainless steel. 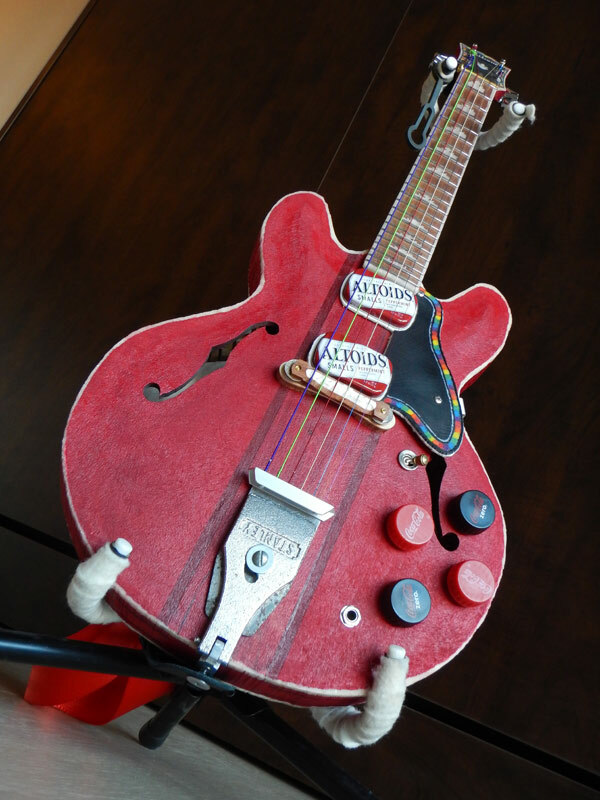 It's a true kid's guitar (unlike those so-called junior guitars). 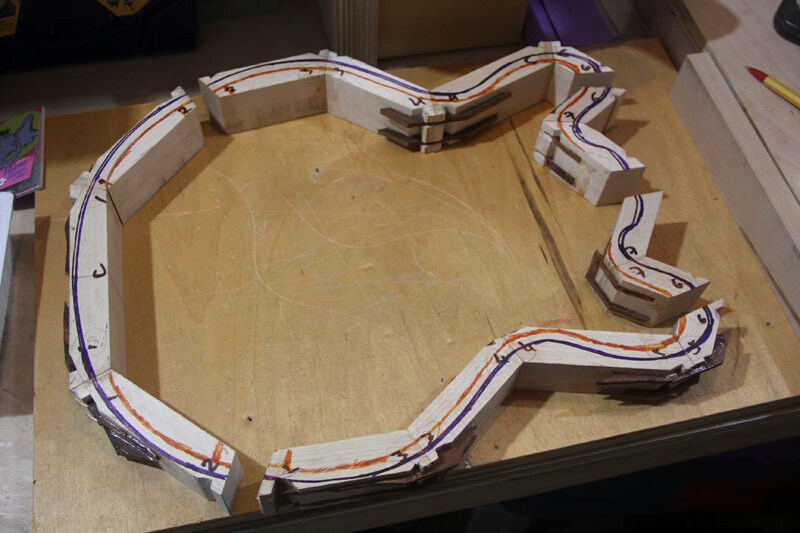 It has an 18,25 inch scale length, a smaller string spread, so it required custom pickups. And it is re-proportioned to work for a kid. It is tuned to standard pitch with extra heavy gauge strings and really low action. My kid plays it all the time. He really loves it because he helped building it (anything that didn't involve cutting). That is great, he is one lucky kid. When my 2 daughters were very small I made them a miniature SG each, about 10" end to end, from 3/8" mahogany ply cut to the shape with the stings, bridge, pick guard and controls added with a sharpie. I think one is still around somewhere. (My girls are in their mid 30s now and one still plays guitar). And thanks for all the pictures! You used a lot of recicled material, that is very nice! I always look for cheap/free stuff to use in my builds. 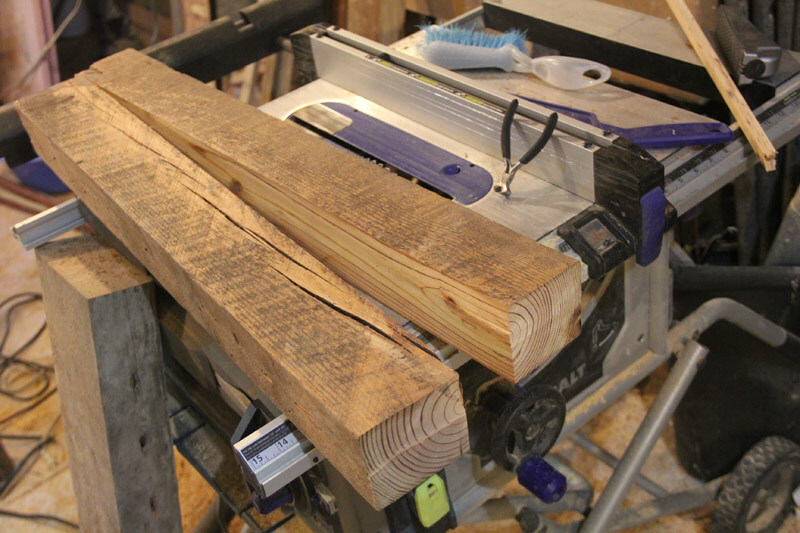 Most of the wood I use comes from old furniture, sometimes you find a good piece of solid wood! Well, now that I have a bunch of old TV speakers I did some more experimenting, breadboarding circuits with LM386 and now I definitely found a simple circuit that sounds much better than the Marshall MS-2. I am now only playing with various configurations of connecting a 10K thumbwheel pot for pins 1 and 8, for gain control. I am changing caps and resistors connected in series with the pot, so that the volume is a bit lowered, wish cuts down on feedback. I have pretty much no idea what I'm doing, so I'm just picking caps and resistors at random, to see what happens. Interestingly, with this approach I am already getting better sound than what comes out of the expertly engineered MS-2. I am not sure if it will fully work without feedback, but it seems to be getting there. The circuit that I now have on the breadboard is Frankensteined together (by trial and error) from various LM386 circuits I found online. So, I guess it's my own "design". One thing I could use your help resolving is how to simply cut down on the piezo output, to match with the output I get from the wound pickups? The guitar has both, switchable through push/pull puts. 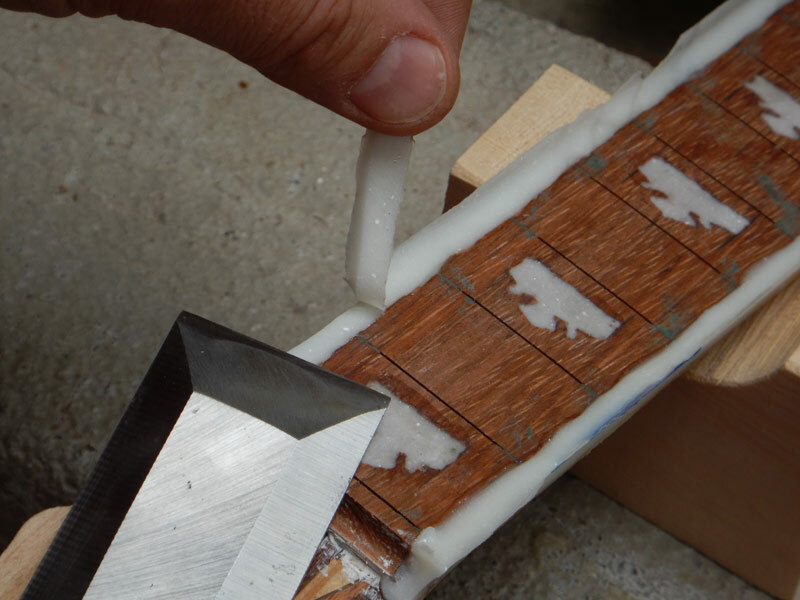 BTW, the archtop bridge has two piezo elements epoxied inside the two footsies of the base of the bridge. I get really clean sound from that. Another piezo is just inside the sound box, which gives me more of a cigar box sound. I'd like to keep that sound, but need to cut down on volume, because that's the last remaining thing that gives me feedback. You likely need a isolation pad of rubber between the element and sound board. Also note they are quite pressure sensitive, i.e the more contact pressure the louder the output. Caps in series with the signal path = smaller values cut more bass. In parallel (across the signal path) = larger values cut more treble. Re magnetic pickups. The covers are likely steel and will severely effect the output and tone result. Any cover needs to be a non ferrous metal like brass. And may I say it's a brilliant effort. Rather than cutting the piezo output could you make/find plastic covers for the wound pickups and print Altoids labels and glue those on (and clear varnish over the top) so they still look the same but don't attenuate the signal? Post your 386 schematic here and we can check it. This is a very informative post, for someone like myself, who knows very little about electronics. I'm really more of a mechanical DIY-er. Wouldn't the rubber layer result in more muffled output from the piezo? phatt wrote: Also note they are quite pressure sensitive, i.e the more contact pressure the louder the output. What you say here makes a lot of sense. The internal piezo that is giving me the loudest output is actually jammed between the center block and the internal brace that is under the archtop bridge. There's a lot of pressure on that piezo. 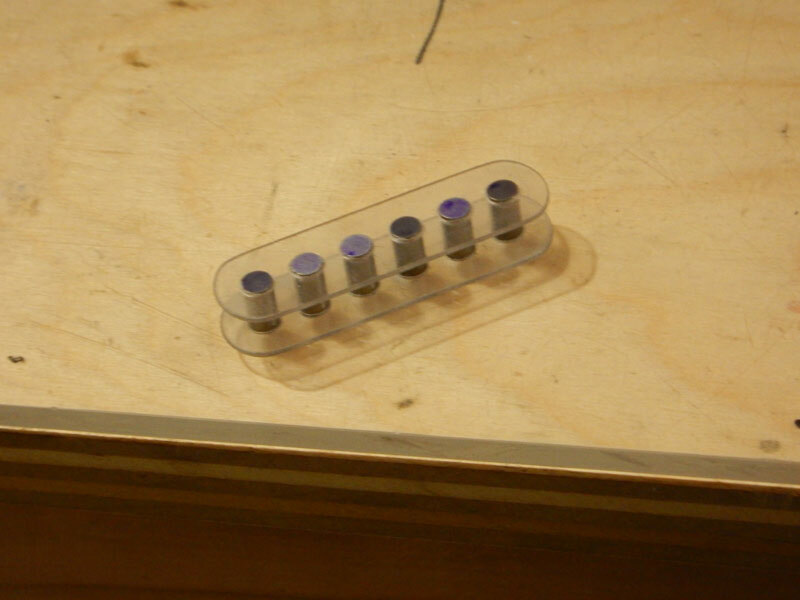 Even more so than the two piezo elements that I've epoxied in the external base of the bridge. This gives me an idea... 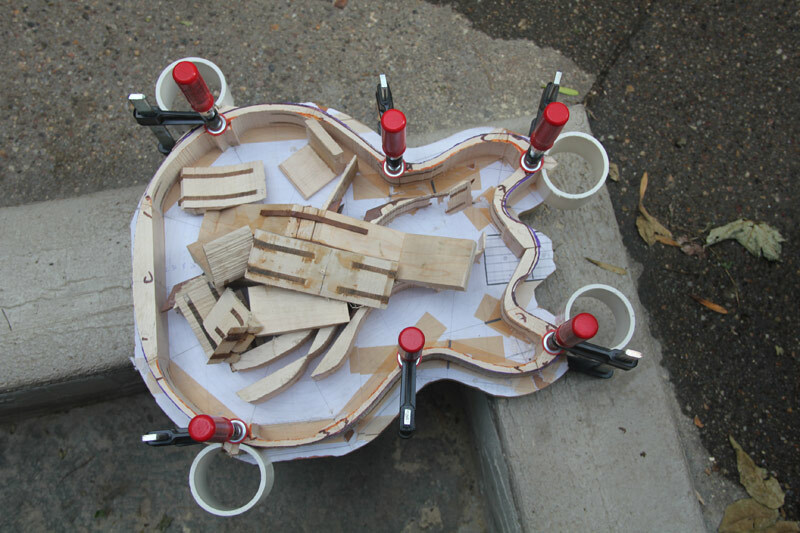 Since this guitar is a rugged home build, anything goes. So, could I possibly build a simple pressure calibration device that goes over the piezo? I'm imagining I could build an up side down U shape frame with a calibration screw in the middle, that pushed down on the piezo. Then I might be able to find ideal pressure to adjust the output of the piezo. Do you think this would work? Thanks for this info. Very valuable to me. phatt wrote: Re magnetic pickups. 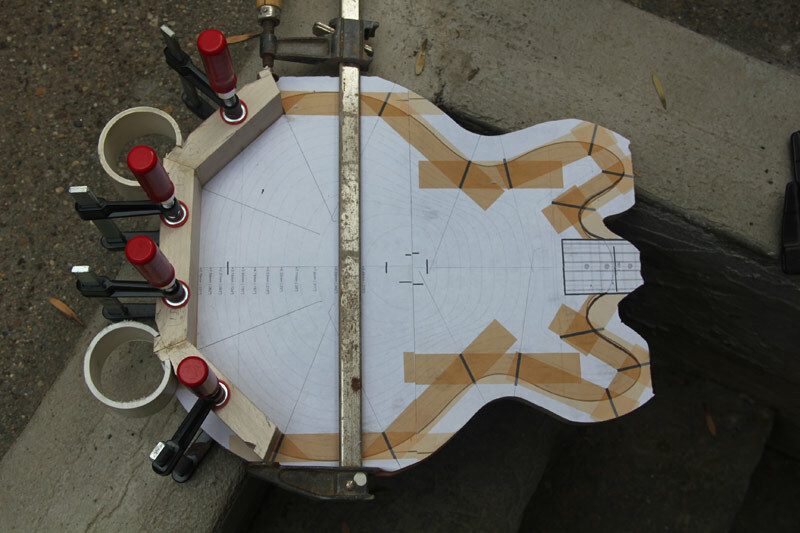 The covers are likely steel and will severely effect the output and tone result. I've come to realize that after I built it. One problem is that my 5-year old really wants those Altoids covers and there's no arguing with a 5-year old... 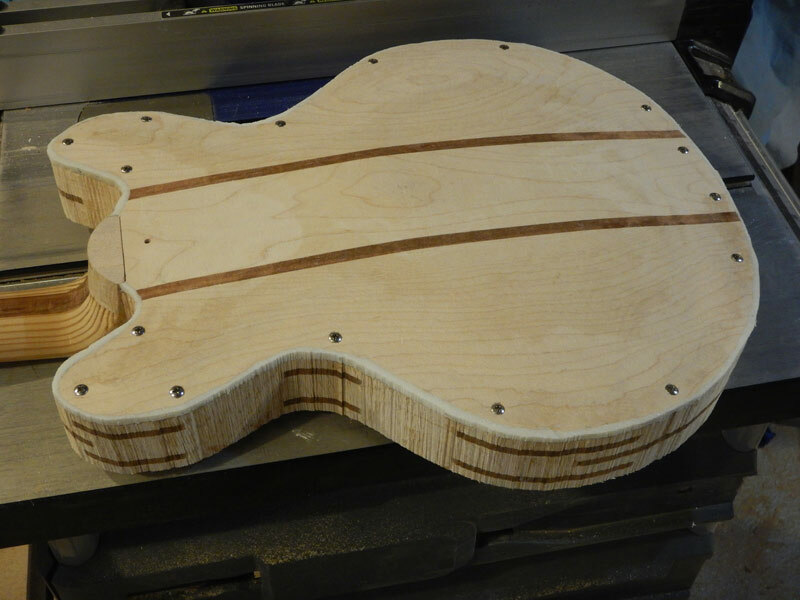 The other issue is that Perhaps its not such a bad idea to make a kid's electric guitar with a bit lower output, as any kid will be likely to crank up the volume. But I will build more guitars and will definitely be exploring other, non ferrous, options for pickup covers. phatt wrote: And may I say it's a brilliant effort. Thanks for the nice words, and once again, thank you for the useful information. 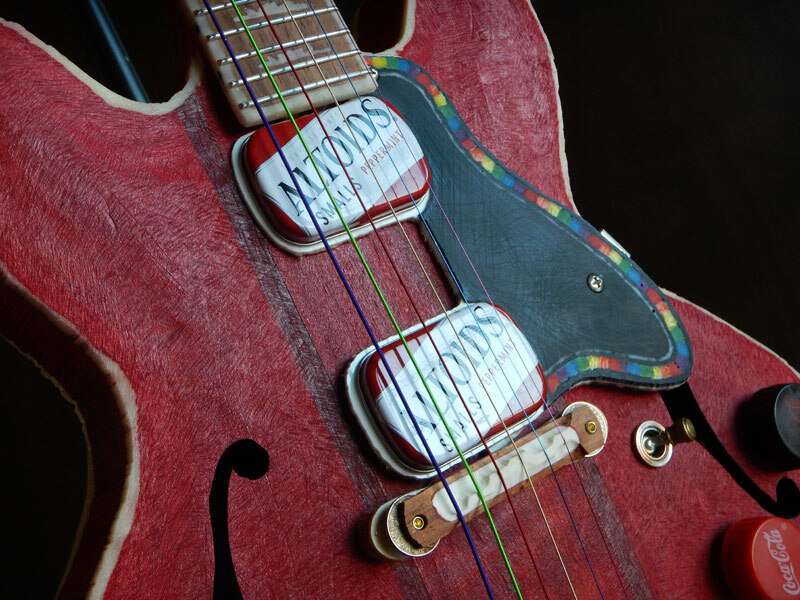 deltafred wrote: Rather than cutting the piezo output could you make/find plastic covers for the wound pickups and print Altoids labels and glue those on (and clear varnish over the top) so they still look the same but don't attenuate the signal? Makes a lot of practical sense, but in addition to the comments I made when replying to Phil, there's also the issue of using authentic recycled materials. I think I'd be better off finding some plastic candy containers for the next build. This one would require too much work to fit with different covers because of everything else that was built to match the Altoids covers. deltafred wrote: Post your 386 schematic here and we can check it. Some of the earliest barcus berry piezo PU's where simply a G type clamp that mounted on the side of the body of a guitar and (If I recall) you could alter the pressure and position of the PU for different effect on tone and output. Violins and such instruments,, same idea. The new Violin types are a small little g clamp that mounts directly onto the vertical bridge piece and again the pressure can be altered via the screw. As to the rubber muting tone **Yes** that is the whole idea as these piezos have a huge hi frequency response and direct mounting can be problematic and cause all sorts of problems,, one being massive feedback. Think of a car with no springs and no shock absorbers,,,, I doubt you would like the ride. They do of course have a completely different response to mag PU's and a lot of circuit tricks are still needed to wipe off excessive hi frequency response. With Gut strings (Classical Guitar) the extra top end is not so obvious but with steel strings that excess top end can destroy the natural mellow acoustic feel. I've had to do a lot of work to get rid of the excess top edge of my Steel Electro Acoustic. Just wanted to say thanks for all the additional information and the helpful article. OK, so I have some issues to discuss about piezos (after reading the above post and linked article) but let's keep it one thing at a time. So, here's the schematic for the amp I breadboarded. Although it's far from being a great sounding amp it actually sounds better than the MS-2, mainly cause there's not a drastic difference in volume between clean and OD sounds. I'm not even sure if C3 and C4 do anything, but I found some schematics were those were included, so I just put them there. Are they needed? The reason I used a 10K pot is because that's the only value of a thumb wheel pot that Radio Shack carries. Circuits I found called for 1K to 5K, but my 10K seems to work just fine. I usually download a datasheet for anything I am messing about with, a lot of it might be over your head but it is always best to start with the manufacturer's schematic, one can be found here. C4 is for smoothing any ripples on the power supply 9v line, either those that come from the power supply due to poor regulation or smoothing, or generated by the device drawing varying current so causing the voltage to very in sympathy due to the impedance of the power source and the wires connecting it to the device. It should be fitted on (almost) every circuit. C3 will decrease the power supply noise (hum) that gets through the circuit, probably not needed for battery operation. Looking at the datasheet it appears that you should have a 10uF capacitor in series with your volume (gain) control, see circuit 3 of the Typical Applications on the linked datasheet. Thanks, again. This is, once again, informative. I just noticed that some were using some capacitors for some pins and others weren't so I was just combining things from different circuits to see if I get better results. pling a resistor (or FET) from pin 1 to ground. When using the LM386 with higher gains (bypassing the 1.35 kΩ resistor between pins 1 and 8) it is necessary to bypass the unused input, preventing degradation of gain and possible instabilities. This is done with a 0.1 μF capacitor or a short to ground depending on the dc source resistance on the driven input. Are they talking about a 0.1 μF capacitor or a short to ground on pin 7? I used a 47μF cap there. Should it be a 0.1μF? Or a short to ground? Most diagrams show input connected to PIN 3, and PIN 2 to ground. But the AM radio amp schematic on the datasheet and also the Ruby amp have this reversed? Does anyone know why? Yep, they may have changed the odd value to get the gain they want, but it all usually originates from the manufacturers datasheet. The original Fender tube amp schematics were supposedly lifted straight out of the RCA tube data book. Years ago I worked in a R&D lab, we had a bookcase that took up a whole wall full of databooks, they were in constant use. This was pre internet, I don't suppose manufactures post out databooks anymore when you can grab them off the net. Dixie Guitars wrote: What does this mean in layman's terms? You can also control the gain with a resistor (in series with a capacitor) to ground. You can use a FET as a variable resistor so could substitute the resistor with a FET (drain - d and source - s). Varying the voltage on the gate will alter the resistance between the d & s. This control line can be very long because the DC voltage is not susceptible to the problems you would get with audio over that distance. You could cut the volume when say phone rang, or increase the volume when background noise increased, or the speed of your car increased. The possibilities are only limited by the imagination. Dixie Guitars wrote: Are they talking about a 0.1 μF capacitor or a short to ground on pin 7? I used a 47μF cap there. Should it be a 0.1μF? Or a short to ground? I am pretty sure they are talking about the unused input not pin 7. I haven't studied the datasheet closely but pin7 looks to have a cap to ground when you are using higher gains above the default 20. If they say 0.1uF that is what I would use. There is probably another datasheet that goes into great detail that you would refer to if you were wanting to design something a bit out of the ordinary, for audio amp applications just follow their recommendations. The 386 is a basically a power opamp tailored to audio applications and as such you can use either, or both, inputs. Opamps have 2 inputs, + and -, the output voltage is the difference between the 2 inputs multiplied by the gain so if you have a 4mV differential and a gain of 20 then the output voltage would be 80mV. It is good practice to keep the impedance on both inputs the similar (the same if possible). If you want to get into great detail then Google opamp theory, for pedal building a basic knowledge is all that is required. But which pin is the unused input? Unused input is pin 2, which you have taken to ground. deltafred wrote: Unused input is pin 2, which you have taken to ground. Hm, I still don't understand the way the techs have phrased this on the data sheet. They say that at higher gains it is necessary to bypass the unused input by connecting a cap or by shorting it to ground. In all their diagrams (even the one using minimum parts) that input is already connected to ground. The only pin that I see is really unused in the simplest diagram is pin 7. In other diagrams that pin is connected with a dotted line to ground, through an unlabeled cap and the words BYPASS appear next to the cap. From this I am concluding that they must be talking about pin 7. 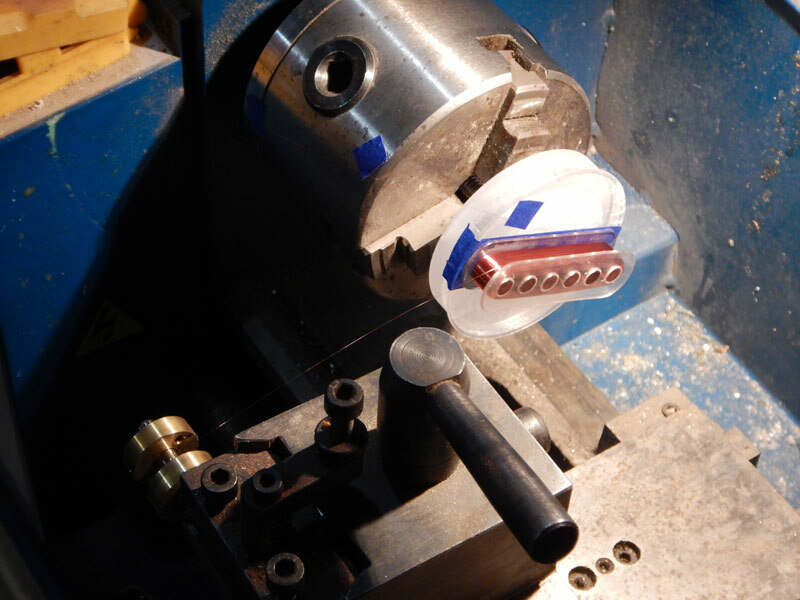 Dixie Guitars wrote: They say that at higher gains it is necessary to bypass the unused input by connecting a cap or by shorting it to ground. In all their diagrams (even the one using minimum parts) that input is already connected to ground. I think that they mean if you are designing your own circuit then you should either connect the unused input to ground, as they have done, or bypass it with a 0.1 cap. Pin 7 is for adding a capacitor to decouple the input stage from any power supply variations, look at any tube amp schematic and you will see it. The higher the gain the more important it becomes to get rid of any power supply hum and aid stability. OK, I read more about OP amp theory and I now understand the logic in the data sheet phrasing, so I understand that you're right. Most of the theory is still too difficult for me to process and absorb as I'm reading it, but I think I'm making progress. In any case, thanks for taking the time to explain.